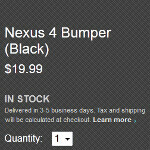 Google Nexus 4 bumpers back in stock at the U.S. Google Play Store, now how about the phone? Guess what is back in stock at the Google Play Store? The Google Nexus 4...bumpers. Oh, if only we had stopped before writing bumpers, we could have made many people happy. Still, those lucky enough to have been able to purchase the phone will want to have some protection for the device, and that is what the bumper offers. The bumpers have been out of stock, but can now be ordered for $19.99 with delivery in 3 to 5 days. 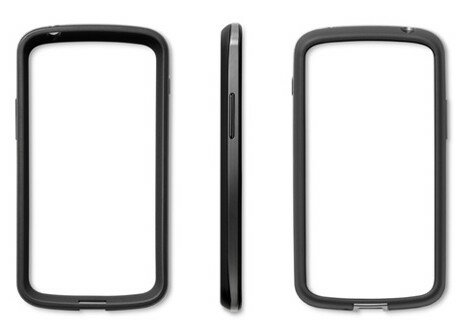 By covering them with the rubber, the sides of your Google Nexus 4 are protected. By raising the back of the device slightly, it helps prevent it from getting scratched. The bumper is available in black and if you want one, you can click on the sourcelink to place your order. Considering that it has been sold out before, we wouldn't wait too long before making the purchase. Finally! I think it is a bit high for a bumper case at roughly $27+ after tax and shipping, but I've heard it's a quality piece and I did order one. Now, hopefully it'll be here in 3-5 days like it says instead of getting a backorder email and getting stuck in limbo. Just ordered one for my girlfriend and i!!! :) FINALLY!! I think Google will not go with LG again after this fiasco with not having enough stock. Samsung didn't have this issue with keeping up with stock when the price was dropped to $349. The Nexus 10 was delayed a week which is acceptable. 8gb sold it again and the 16gb delayed still 5-7 weeks is not acceptable. the Galaxy Nexus was many months old when it's price dropped, if it had launched at $350 off contract there would've been similar issues. So when Samsung announced the Galaxy S III to the major carriers I didn't see anyone waiting weeks. Galaxy Note 2 there was no waiting. AT&T near me waited three weeks for the Optimus G to arrive. Yay! Ordered!!! And I also ordered the Ghost Armor Full Body Clear Screen to fully protect my LG N4. Now I can sleep better! Says it's sold out again. Will there be a price drop on nexus 4 ?